When Brazil was honored at the Frankfurt Book Fair in 2013, the Brazilian author Luiz Ruffato opened the event with a provocative speech, claiming that literature, through its pervasive depiction and discussion of ‘otherness,’ has the potential to provoke ethical transformation. 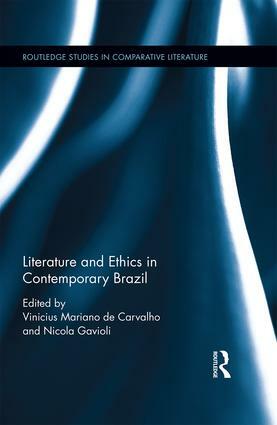 This book uses Ruffato’s speech as a starting point for the discussion of contemporary Brazilian literature that stands in contrast to the repetition of social and cultural clichés. By illuminating the relevance of humanities and literature as a catalyst for rethinking Brazil, the book offers a resistance to the official discourses that have worked for so long to conceal social tensions, injustices, and secular inequities in Brazilian society. In doing so, it situates Brazilian literature away from the exotic and peripheral spectrum, and closer to a universal and more relevant ethical discussion for readers from all parts of the world. The volume brings together fresh contributions on both canonical contemporary authors such as Graciliano Ramos, Rubem Fonseca, and Dalton Trevisan, and traditionally silenced writing subjects such as Afro-Brazilian female authors. Essays deal with specific contemporary literary and social issues while engaging with historically constitutive phenomena in Brazil, including authoritarianism, violence, and the systematic violation of human rights. The exploration of diverse literary genres -- from novels to graphic novels, from poetry to　crônicas -- and engagement with postcolonial studies, gender studies, queer studies, cultural studies, Brazilian studies, South American literature, and world literature carves new space for the emergence of an original　Brazilian thought. Vinicius Mariano de Carvalho is Lecturer at King’s Brazil Institute at King's College London, UK. Nicola Gavioli is Assistant Professor of Portuguese at Florida International University, USA.